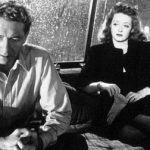 Might noir master James M. Cain have drawn inspiration from Russell’s? Hours: Open 7 a.m.-9 p.m. Sunday through Thursday; 7 a.m.-10 p.m. Friday and Saturday. Parking: Street or garage at 30 E. Union St. The Set Up: Russell’s is a cozy, upscale diner that’s been around since 1930. James M. Cain’s novel “Mildred Pierce” (published in 1941 and made into a movie with Joan Crawford in 1945) was set in nearby Glendale. Mildred made her small fortune in the restaurant biz; perhaps Cain drew some culinary inspiration from this spot. 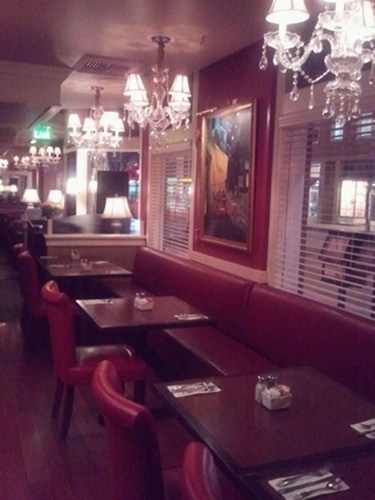 The Style: In terms of décor, Russell’s, with its red leather seats and chandeliers, feels more American bistro than trad diner, but then what’s wrong with some swank while you sup? Nothing in our book. A slice of pie to make Mildred Pierce proud. The Stuff: The lunch/dinner menu has a nice variety of meat, fish and pasta dishes along with burgers, sandwiches and salads. We tried the grilled salmon salad (the fillet comes on a generous bed of pristine romaine lettuce, tomatoes and vinaigrette dressing) and a glass of The Crossings New Zealand Sauvignon Blanc. 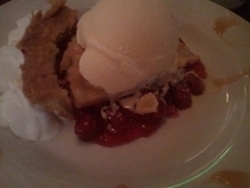 For dessert: cherry pie à la mode mode with coffee. Delicious, fresh and packed with fruit, the best slice of pie we’ve tried in quite a while. The Sting: Would be nice to see a cocktail list, but Russell’s is licensed for wine and beer only. The Standout: The food is top-notch and the service is excellent – friendly, attentive and relaxed. When we asked the server what kind of coffee was used, he went to the kitchen to check and brought out a small package of Apffels for us to take home. Lovely! Btw, this weekend is the last chance to see “A Conversation with Edith Head,” starring Susan Claassen, at the Pasadena Playhouse. This great show closes Dec. 1.